Once again this morning when I mounted Bessie, I was completely expecting to see a gain. Another 0.6 lbs of weight gone is KILLER. 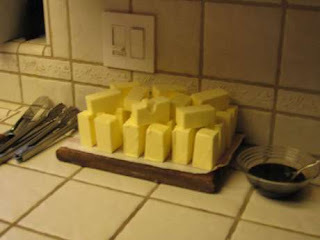 In the last two days alone I've lost almost 5 sticks of butter. The amount of butter in the picture above is equivalent to the three lbs I've lost since Monday. That's a friggin lot. I am sure that in the near future I'll be a'weeping and a'wailing about stalling out, so while the crazies are at bay, I'm just gonna enjoy the ride.